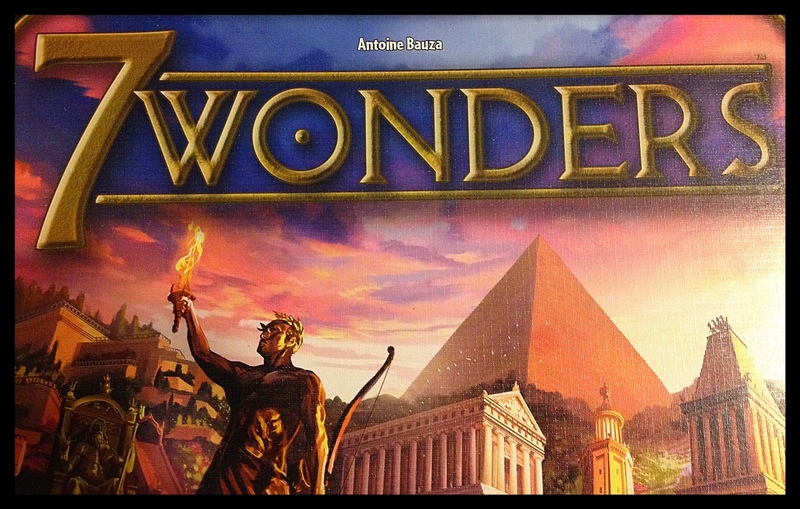 I was recently introduced to the fantastic board game 7 Wonders by Asmodee Games. In this game, you are the leader of one of the great cities of the ancient world charged with leading your city to fame and renown. Each player takes on the role of one of these cities, and through a combination of resources, commerce, civic engineering, and military, tries to amass the greatest number of victory points. While each city has an accompanying wonder (the completion of which is worth quite a bit of victory points as well as other advantages), this is only one of several viable paths to victory. At its heart, 7 Wonders is a card development game. The game is played over three ages, with the cards becoming increasingly more expensive and complex as you move through the ages. During each age, each player is dealt seven cards. Each turn, you play a card, pay any associated costs, and then pass the remaining six cards to the next player. Some of these cards have immediate bonuses; others provide resources; others are used to increase your military might; and still others provide bonuses or special abilities that will help you on subsequent turns. After each player has played six cards, the final card is discarded, and that age ends. Your military then faces off against your two adjacent players (adjacent in real life, not in ancient world geography), with victory points given to the victors and lost by the defeated. Once all three ages are over, each player figures out the total number of victory points scored, and a winner is declared. Since play is simultaneous for each player, each age goes surprisingly quickly. While your first game will probably take close to an hour, subsequently you should easily be able to complete a game within 30 minutes. Even with a full count of six or seven players, things still move at a fairly rapid pace. Being able to get through a whole game in such a short amount of time is definitely a rarity in these types of board games! While fairly simple to learn, there is a surprising amount of depth and variation to the game. Each civilization is scored across a range of different accomplishments, including Military, Wealth, Wonder, Civic, Commerce, Science, and Guilds. It's generally impossible to excel at all these areas. Indeed, the game incentivizes you to focus your strategy by having different cards within the same family synergize well together, giving you bonuses or even allowing you to play certain cards for free. The production quality is also great. Each civilization has a double sided Wonder card that serves as a visual reminder for the most important elements of the game. The artwork for the cards is evocative and well done. Most of the time the text on the cards is sufficient for you to understand exactly what the card does, although some of the more complex cards might require you to reference what some of the more obscure symbols mean. This is probably the only significant shortcoming of the game, as it isn't always immediate clear how some of the more advanced cards function. 7 Wonders is a fantastic game, and one that I highly recommend you pick up. It's fast, varied, and plays well for any number of players from 2-7. That alone makes it stand out from many other similar boardgames. Great Boardgame even deeper and entertaining with its extensions ; Leaders, Cities, Wonder Pack, and Babel (collaborative), Armada soon coming maybe too.